The temperature is starting to rise but so are air-conditioner settings inside buildings which means a lightweight jacket is often required! 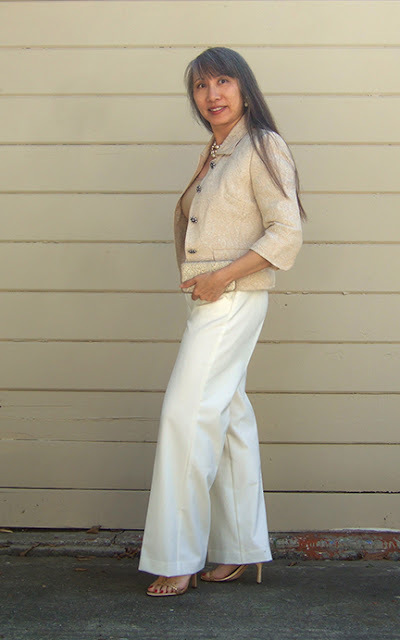 Spring jackets are such an easy way to add color, texture, personality and sophistication to an ensemble that Adrienne of The Rich Life (on a budget) and I wanted to devote this month’s “How I Wear My” to them. I loved how stylish and inventive everyone was with their jackets, which made this one of my favorite posts to put together. Enjoy! I never get tired of the ladylike look so I adore this outfit on Adrienne, which gets extra points from me for the shoes (Valentino-on-a-budget indeed. I approve!) and the bracelet. What a wonderful spring ensemble! I not only love this outfit on Cynthia I think this is a great photo in general and my new favorite of her in particular. She looks gorgeous! I do love the photo of her I am sharing here, featuring Jacket Society’s Savannah Stripe jacket in gray with three-quarter sleeves, worn with a pencil skirt. 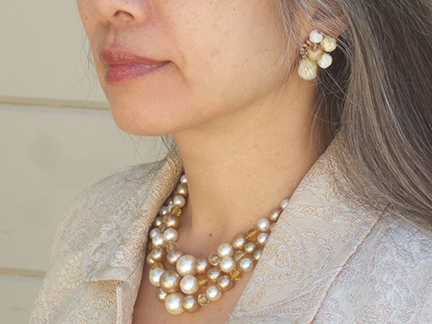 The pearl cluster necklace is also by Jacket Society. Nora always inspires me with her jacket looks. I know my thinking about jackets so much these days is a direct result of all the fabulous outfits she puts together with them! Tamera looks so beautiful in this outfit—I especially like those long earrings!—and I love the golden and ethereal quality of this photo. A gorgeous and dreamy shot of her! I love this sophisticated ensemble on Greetje. The kimono-like jacket pairs so well with slender pants and high heels, which are of tiny leopard print. And do note the snakeprint coat in her hand. Doesn’t she look gorgeous? As much as I have had navy, white and turquoise on my mind, I think this is my new favorite picture of Alice. Her outfit is summertime perfection in my book, right down to her baby blue pedicure! Beth of Style at a Certain Age. Beth looks so fabulous in this ensemble, I love the addition of pearls and bright red lipstick and nails! Teresa, wife of photographer Denton Taylor. 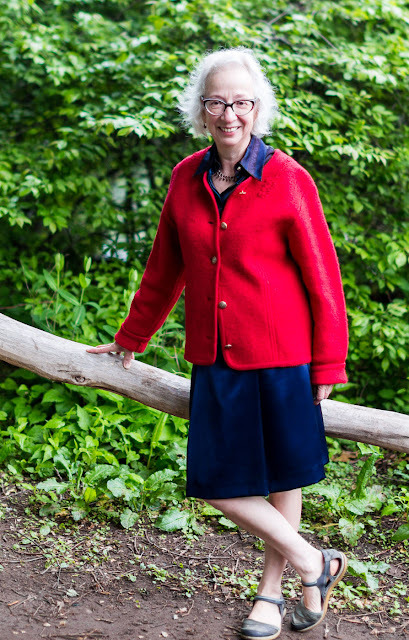 I really like this vibrant red paired with deep blue on Teresa and I am happy to report that in NYC the temps have cooled off after a temporary spike and Teresa might have worn this jacket again this week! I like that Sylvia wore this jacket with a floral skirt (which seems to be dégradé towards the bottom hem, which I adore) and added red accessories. 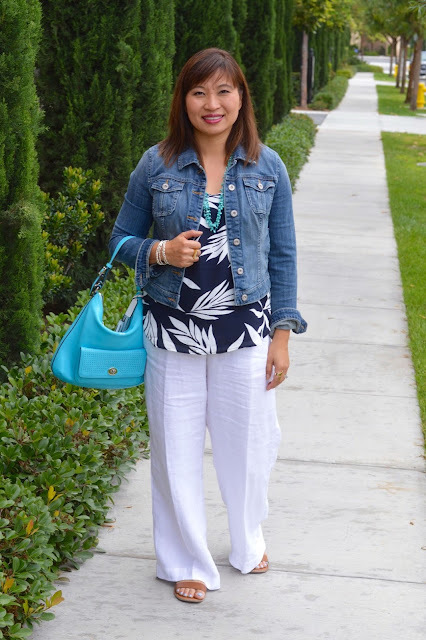 What a fun spring ensemble! 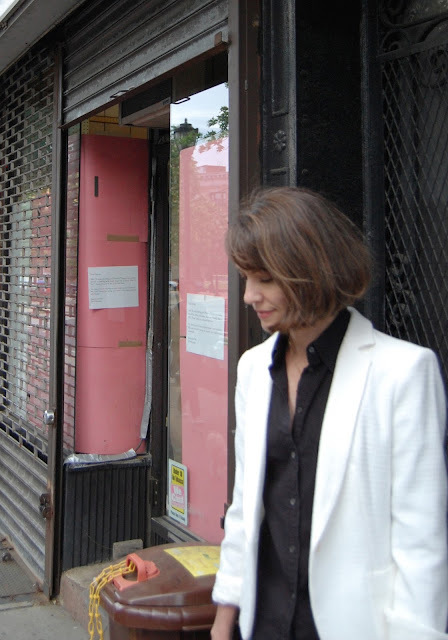 I like Ana’s edgy look here with her spring jacket and I know what she means about back and forth with weather—it has been running from hot to cold here in NYC! I love these colors on Happyface, especially that orange next to that particular shade of dark green. It’s quite pretty and made even more glamorous with the addition of big pearl earrings! 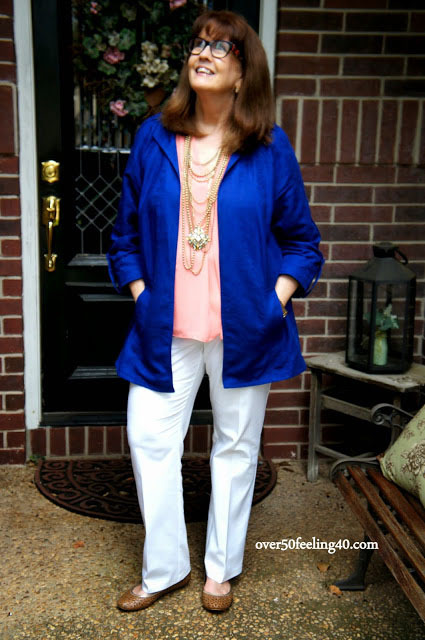 This seems like the definition of the perfect spring jacket! Maryna is overlooking Palermo, Italy in these pictures, our lucky world-traveling friend! Doesn’t the green of her jacket look wonderful against these stunning blue skies? Not only does Suzanne look divine—I love the details on the jacket in particular—she could be one of the beautiful poster gals for shopping secondhand first! I never get tired of the Chanel look so I am a big fan of this elegant yet playful ensemble on Dawn Lucy and I really like that tassel necklace on her! Left to Right: Jodie, Nancy, and Charlotte as styled by Jodie of Jodie’s Touch of Style. 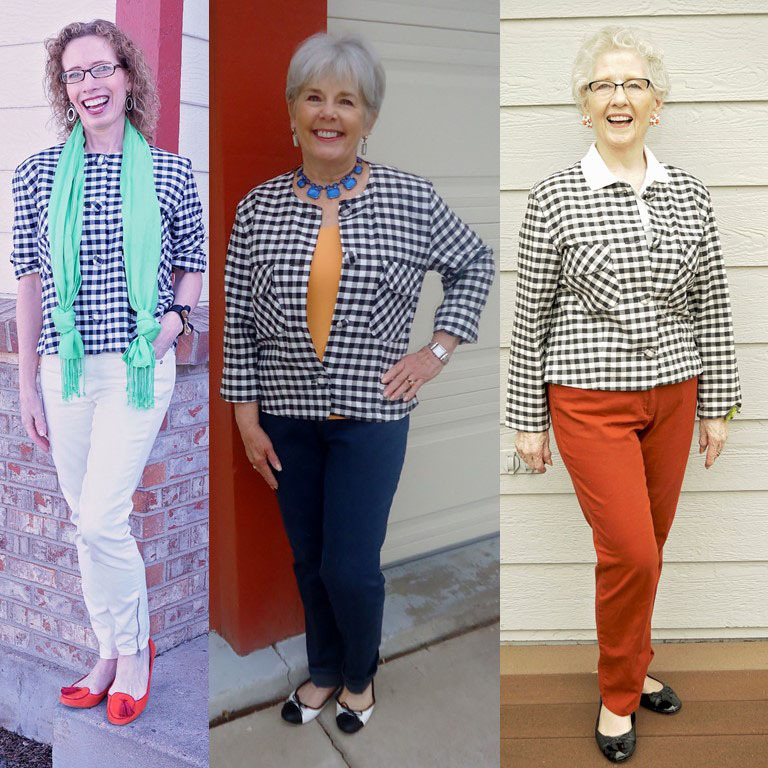 How fun that Jodie gathers her stepmother, Nancy, and her mother, Charlotte, as well as herself, and styled three different looks with one jacket. I always like seeing gingham this time of year too, to me nothing says summer like gingham! Pam of Over 50 Feeling 40 looks amazing in a deep blue jacket accessorized with her gem pendant necklace from the Limited that is my new favorite piece of jewelry she owns and which I have told her she should consider one of her good luck charms since it is so lovely on her! She mixed it with a Chico’s necklace and I love the look, it reminds me of a modern day flapper! 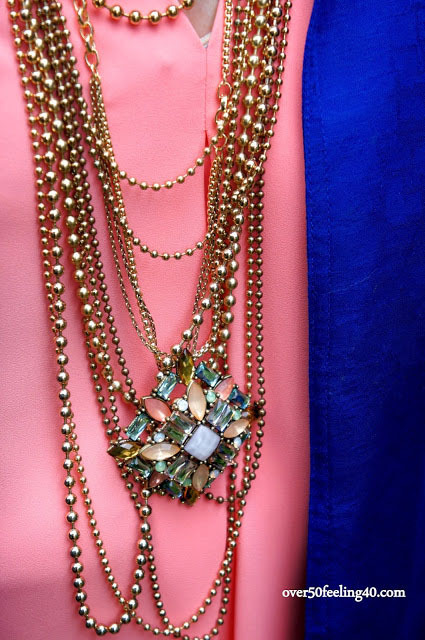 A detail of the fabulous jewelry! Susan of High Heels in the Wilderness says on a recent month-long trip to France she mostly wore this Paige jean jacket during the day since it was cool and very windy. She paired it with a navy gingham Equipment blouse, black sweats from Aritzia and Stan Smith sneakers. I love that Susan was running around France looking so fresh, fun, and sporty! Yvonne’s jacket reminds me I need to add a denim jacket back into my wardrobe. She looks so feminine and pretty in this combination. Linda of A Labour of Life says this houndstooth jacket from Sheinside has been getting a workout this year. She writes, “There is something about a classic coat that can take even the most casual outfit and make it feel appropriate. I was strolling through Old Quebec and felt just as CHIC as those around me. (Maybe a silver oxford and a ginormous bun doesn’t hurt, right?). 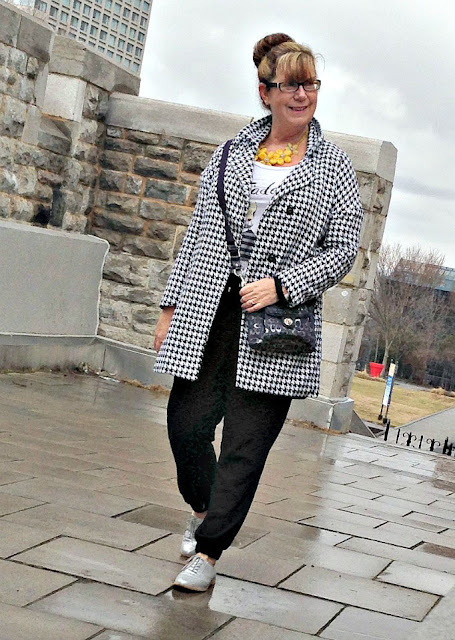 I never get tired of houndstooth so I love this jacket on Linda, especially with those silver oxfords and the yellow necklace to make the whole outfit pop! And Old Quebec? I am so jealous, I definitely want to go there. Lucky Linda! I think this is such a great look on Trina and I love how she kicked up a white dress several style notches with the addition of the horizontal stripe jacket, pearl necklace, and a bright yellow clutch! Paula of That Was Then This Is Wow. Paula of That Was Then This Is Wow is wearing a gorgeous gold jacket (love the buttons!) with white trousers, a vintage necklace that belonged to her grandmother, and vintage Bakelite earrings she found in a thrift store. This is such a wonderful gold and white ensemble on Paula and because I think about jewelry so much these days I especially love the necklace and earrings she is wearing! Isn’t this a beautiful dressy look for summer? I adore Paula’s jewelry selections here! Forget the jacket, check out the texture in the background. So very New York! Even though in the past I have written about my love for cardigans, I am trying to wear more of my spring jackets this year, especially this textured white one I picked up at Zara a couple of years ago. I have been wearing it these days with jeans or cropped black pants. I love the polish it brings to any warm weather outfit. 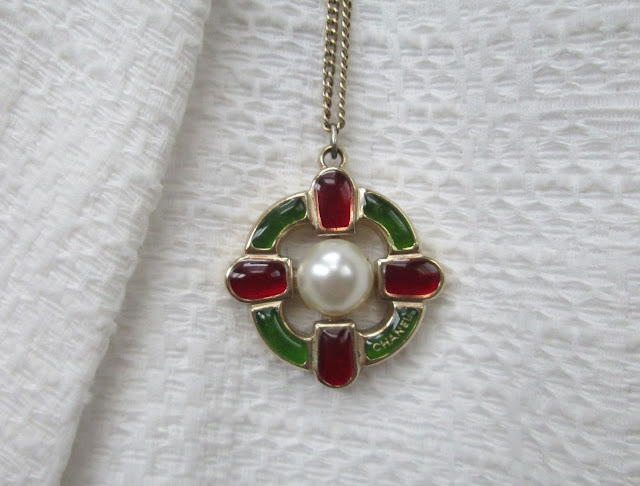 And ever since reading Helen Gurley Brown’s advice to not hoard anything you own in terms of clothing and accessories, I have also been trying to wear this lovely Chanel pendant that I picked up on eBay awhile back. It is one of my favorite pieces of jewelry! Detail of the Chanel pendant against the texture of the white Zara jacket. I love them both, especially together! For July, find your favorite clutch and share it with us! It’s that time of year when you may find yourself invited to a summer brunch or soirée that requires you carry the lightest of bags to hold only the essentials! Whether it’s vintage or new, elegant and sophisticated or high-spirited and funky, we would love to see what small strapless bag you have in hand so join us for “How I Wear My: Clutch.” Send photos and a short description by July 6, 2015 to howiwearmy@yahoo.com. 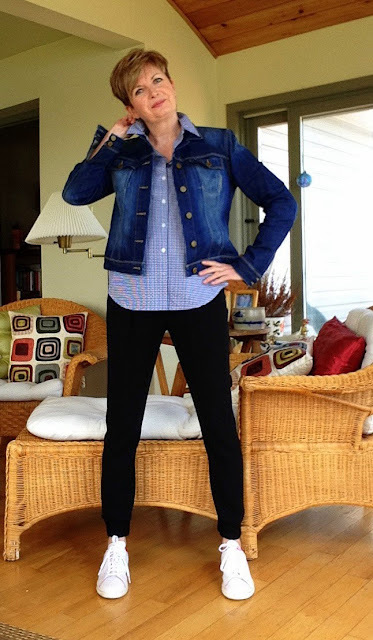 Do stop by Adrienne’s to see even more amazing looks featuring spring jackets. So many great looks here, Jill. I love your pendant with the white jacket...and on my site I am wearing brown and white today!! 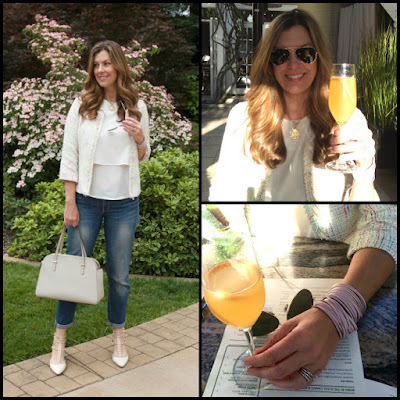 Thanks to you and Adrienne for bringing us wonderful style inspirations. Jill, great round-up this month! Nice variety of jacket styles, I love your white blazer and of course, I'm drooling over your Chanel pendant. A white blazer is always so sharp! So many varied wonderful looks here. I love it! Jill thanks for another beautiful and inspiration post my dear! I always look forward to this monthly feature! Beth of Style At A Certain Age has my heart racing in her fantastic animal print coat! What a perfect finisher for a black and white palette! I know I will now have my eye open for one! Thanks again for this stylish post my dear! It is a good thing I don't have to be a judge as I wouldn't be able to choose. Very nice to see so many great jackets. And that lovely yellow clutch of Trina is new to me. This is the best installment yet of this interesting series. Jackets do more for an outfit than anything else and can be worn quite often....best equity ratio in a wardrobe if done right and these all were well done. Liking that white Zara Jill ! Another fun round up and you're looking so chic in black and white, Jill! Wow! I am seeing some of these looks for the first time. Loving all the variety. So many lovely and stylish people here! I can't believe you found that pendant on eBay. What a treasure! Thank you for another - 47! - great HIWM! What an amazing collection of jackets. Loving all the denim! No doubt the go-to jacket for spring. 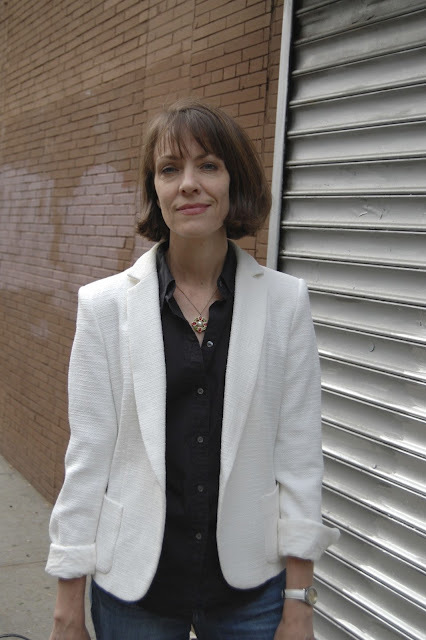 I love the contrast between you white jacket and the dark button down. 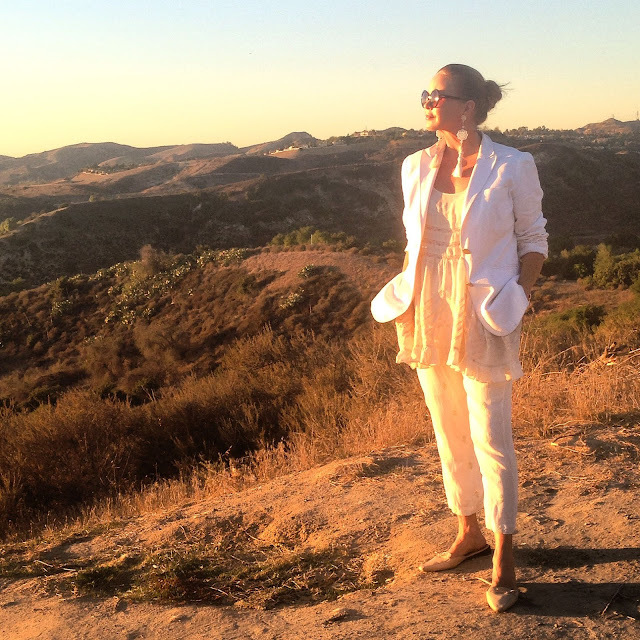 White blazers are perfect for spring. And thanks for featuring me! I always enjoying seeing all the different looks here! I love your blazer that it has a great texture to it. Congratulations to you ladies on another inspiring post. I love jackets and wear them often, especially when the temperature can be unpredictable so this was a fun one. 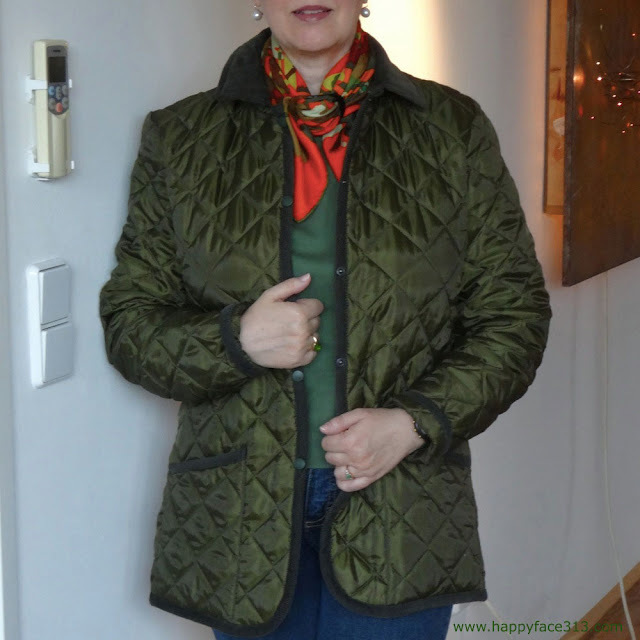 I also love your jacket - the texture is wonderful! What a great variety of styles. I really like Tamara's all white outfit. It looks so dreamy! 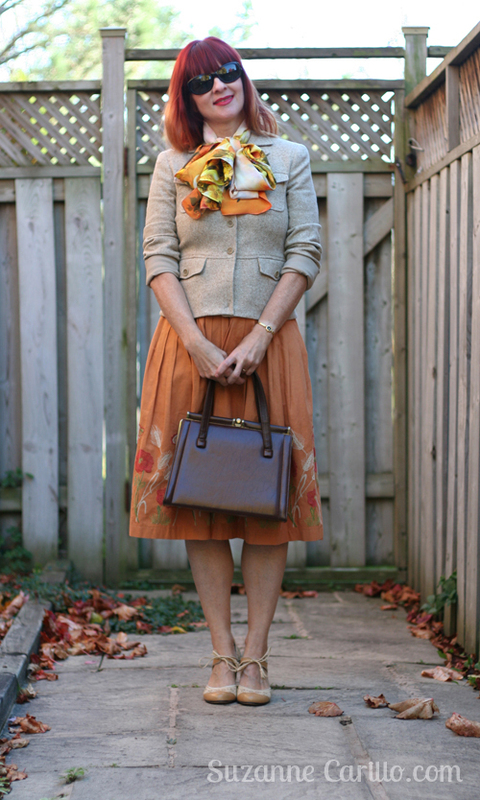 I also love Suzanne's vintage look. Very unique.